Dirk Nowitzki will see limited minutes for the rest of the season and may not play at all in some games, according to Brad Townsend of The Dallas Morning News. Nowitzki hasn’t made much of an impact in his 21st NBA season. He missed the first 26 games because of surgery on his left ankle and has played 10.3 minutes per night since his return, averaging 3.6 points and 1.8 rebounds. Rick Carlisle, who has coached Nowitzki for the past 11 seasons, broke the news to the long-time Mavericks star during Friday’s shootaround. Mavericks guard J.J. Barea is considering his surgery options after suffering a season-ending injury last night, relays Dwain Price of Mavs.com. An MRI showed that Barea ruptured his right Achilles tendon after hitting a layup in the fourth quarter of a victory in Minnesota. The team plans further updates once surgery plans are finalized. With a prolonged recovery time, the injury will limit free agency options this summer for the 13-year veteran, who is making $3.71MM this season. The Grizzlies have been one of the surprise teams to start the season, as they sit firmly in the Western Conference playoff picture at 13-8. As the season continues to unfold, it looks more and more clear that the Grizzlies hit on nearly all of their offseason moves as they’ve built a team that thrives on playing tough, physical defense at a slow pace. Mark Giannotto of The Commercial Appeal is now asking another question related to the Grizzlies’ season, focusing on how the team can improve its roster during the year to capitalize on this fast start. While the Grizzlies do have some expiring contracts on the roster in the form of Garrett Temple and JaMychal Green, those two are key cogs in the team’s rotation, especially defensively. The Grizzlies could use another go-to perimeter player to help Mike Conley, but it may be tough to find an ideal trade that doesn’t see the Grizzlies sacrifice too much on the defensive end. Regardless, Memphis may become an active buyer at the trade deadline should their strong play continue. In a recent mailbag for The Daily Memphian, Chris Herrington addresses potential trade targets for the Grizzlies as they look to address their needs on the perimeter. The Spurs are certainly struggling, as they sit at 10-12 and in 14th place in the Western Conference. As Chelsea Howard points out for The Sporting News, Gregg Popovich is putting a lot of blame on himself as he expects more from his coaching performance moving forward. One bright spot for the Spurs has been the play of Bryn Forbes, who looks to be developing into one of the league’s best shooters, as Bryan Kalbrosky writes for HoopsHype. Forbes has received a much larger role due to the various injuries in the backcourt and is averaging 16.1 points and 3 three-pointers per 36 minutes. JULY 20, 5:25pm: The signing is official, according to a team press release. JULY 10, 12:48pm: The Spurs are finalizing a deal to bring back restricted free agent guard Bryn Forbes for next season, reports Shams Charania of Yahoo Sports (Twitter links). According to Charania, Forbes will sign a new two-year contract with San Antonio. Forbes, who will turn 25 later this month, has spent the last two seasons with the Spurs, becoming a regular part of the team’s rotation in 2017/18. In 80 games (19.0 MPG) last season, he posted 6.9 PPG and 1.4 RPG with a .390 3PT%. Because Forbes has two years of NBA experience, he’ll be on track for unrestricted free agency in 2020 if he plays out his new two-year deal with the Spurs. At that point, the team will have full Bird rights on him. San Antonio figures to re-sign him this time around using his Early Bird rights. The Spurs issued qualifying offers to three players eligible for restricted free agency this summer, and both Forbes and Davis Bertans appear set to return on new multiyear deals. San Antonio’s third restricted free agent, Kyle Anderson, signed a four-year, $37MM+ offer sheet with the Grizzlies which the Spurs elected not to match. The Spurs have extended qualifying offers to Kyle Anderson, Bryn Forbes, and Darrun Hilliard, according to RealGM’s official transactions log. A previous report indicated that San Antonio also issued a QO to Davis Bertans, so all four players are on track to become restricted free agents on Sunday. Anderson, 24, stepped into the starting lineup in Kawhi Leonard‘s place in 2017/18, making 67 starts for the Spurs during the regular season. As a result, he met the starter criteria, increasing the value of his qualifying offer to $4,749,591. The Spurs’ other qualifying offers are more modest. Forbes and Bertans will receive identical QOs worth approximately $1.7MM, while Hilliard – a two-way player – will receive a one-year, two-way contract offer with a $50K guarantee. Any of those four players could simply sign their one-year qualifying offer, but they’ll have other options, including negotiating a new agreement with the Spurs or seeking out an offer sheet from another team. If any of the four RFAs signs an offer sheet with a rival suitor, San Antonio would have the right of first refusal, and would have to decide within two days whether to match it. Of the Spurs players eligible for qualifying offers, only one – Matt Costello – hasn’t received one. Assuming Costello doesn’t get a QO, he’ll become an unrestricted free agent on Sunday, while San Antonio would open up one of its two-way contract slots. The fate of the Spurs is in the hands of Kawhi Leonard and it’s hard to get a clear read on his current relationship with the franchise. With Leonard, a savvy veteran core, and a world-class coaching staff, the Spurs are capable of competing in the West. Without him, however, the forecast in San Antonio is considerably more bleak, and that impacts everything, including the club’s pending free agency decisions. Given the franchise’s track record of stability, I’d posit that Leonard returns at full health next season and this entire debacle gets chalked up to a superstar-level player lacking faith in an organization’s medical staff mandated to prod him back into action as soon as reasonably possible. While much of the disappointment around the team this year can be traced back to this one isolated case of melodrama, that shouldn’t veil the fact that the Spurs – who’ve been ancient for over a decade now – are looking older than ever. Is a major shakeup right around the bend? That may be the case with or without Leonard eventually, but in 2018/19 at least, we can expect something along the lines of the status quo. Like any good Spurs prospect, Anderson slowly marinated in winning culture for three years before taking a leap in the final year of his rookie contract. The versatile forward thrived in the minutes made available by the injury to Leonard and could draw interest as a capable, multifaceted young asset on the open market this summer. San Antonio has some flexibility to match a raise if Anderson’s camp goes out and gets one — the Spurs may have no other choice if they end up needing to consider a full roster reboot anyway. Although he didn’t play major minutes on a consistent basis for the Spurs in 2017/18, Bertans established himself as a player who could contribute when given an opportunity. The stretch four isn’t likely to command a significant price tag as a restricted free agent, so San Antonio could probably lock him in as an affordable, yet capable rotation piece in an effort to add depth to an aging frontcourt. With much of San Antonio’s rotation planted firmly in their late-30s, competent young players that can be locked in to affordable deals are a special commodity. In Forbes, the club has a combo guard capable of instant offense off the bench. The MSU product could generate interest from other teams looking to add fresh legs and a potent long ball, but the Spurs should have enough financial flexibility to match anything within reason. 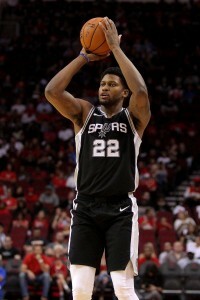 An Achilles injury forced Gay into signing a short-term “prove-it” deal with the Spurs last summer and the combo forward appears to have done just that. Still, while Gay performed admirably in a reduced role with his new franchise, it’s hard to imagine he’d garner much interest on the open market given his age and relatively underwhelming portfolio as a big investment. Gay looked solid as a supplementary player for the Spurs in 2017/18 and seems to be content. Given that there won’t be a long line of teams interested in overpaying for the 31-year-old in 2018, accepting the $9MM player option for next season may be Gay’s best bet. While Green’s calling card has become ever more important in today’s NBA, there’s no denying that the three-point specialist benefited from perfect timing the last time he hit free agency. Green could conceivably turn down his 2018/19 player option worth $10MM next season in the hopes of landing a modest raise on a lucrative short-term deal like J.J. Redick did last summer, but the former bit player could also play things safe and continue to enjoy his last haul. Lauvergne has seen his role decrease as he’s bounced from destination to destination over the last three seasons, but he remains a vaguely intriguing reserve asset despite the fact that he’ll turn 27 before next season. This summer, the big man’s best option to stick around in the league long-term might be to accept his 2018/19 player option and battle his way into a bigger role in San Antonio’s frontcourt. If he does that, he could open more opportunities for himself. The Spurs have consistently paid their veteran point guard eight-digit salaries for the past decade and while his place in the upper echelon of franchise history is secure, the organization doesn’t face any pressure to sign him to a bloated lifetime achievement contract as he enters the twilight of his career. Parker handled a demotion to the second unit professionally this year and has previously said that he’d like to play 20 seasons. That said, if indications that the team’s culture is going south are true, there may not be much of a point to keeping the band together. As much as they would like to get Chris Paul back in the lineup, the Rockets won’t use their new point guard until he is fully recovered, according to Jonathan Feigen of The Houston Chronicle. After playing on opening night, Paul has been sidelined by a bruised knee. He has been swimming and boxing to stay in shape and went through shooting drills Saturday. For his part, Paul is anxious to get back on the court, and agrees with D’Antoni’s timeline, as he tells Sam Amick of USA Today. Mavericks coach Rick Carlisle continues to tinker with his lineup, starting Salah Mejri at center Saturday night instead of Nerlens Noel, relays Brad Townsend of The Dallas Morning News. “He always brings a lot of energy, a lot of fight,” Carlisle said of Mejri, who made his first start of the season. “He brings a certain combative personality to the game, which is something we need right now.” Noel, who is headed toward unrestricted free agency after accepting the team’s qualifying offer this summer, has been in and out of the starting lineup with six starts in 11 games. The Heat didn’t make any roster moves with Rodney McGruder or Okaro White on Tuesday, ensuring that both players remain under contract and received partial guarantees on their contracts for 2017/18, writes Ira Winderman of The South Florida Sun Sentinel. As Basketball Insiders details, McGruder and White are on minimum salary deals worth $1,312,611 for the coming season. By remaining with the Heat through August 1, both players are now in line for about $453K in guaranteed money. Their full salaries will become guaranteed if they stay under contract through the first game of the regular season. Meanwhile, as we noted last night, the Hornets also kept Johnny O’Bryant on their roster beyond his August 1 salary guarantee deadline, making his $1,524,305 minimum salary fully guaranteed. Other players, including Jordan Crawford of the Pelicans and Bryn Forbes of the Spurs, had August 1 salary guarantee deadlines in their contracts as well, per Basketball Insiders’ data. However, we haven’t received confirmation that their guarantees are locked in. Neither Crawford nor Forbes was waived, but teams and players can sometimes agree to push back guarantee dates to create more flexibility for the club — the Trail Blazers recently did just that with Pat Connaughton, whose salary guarantee deadline is now August 31 instead of July 25. For more details on which players have received salary guarantees this summer – as well as which players have been waived before those guarantees kicked in – be sure to check out our full breakdown. The Sixers recalled Tiago Splitter from the Delaware 87ers, according to the team’s website. Splitter was acquired by Philadelphia in the Ersan Ilyasova trade at this year’s trade deadline. The Raptors have recalled Bruno Caboclo from their D-League affiliate, the Raptors 905, per the team’s Twitter feed. Caboclo has played a total of 89 NBA minutes since being selected with the 20th pick in the 2014 draft. The Spurs have recalled Davis Bertans and Bryn Forbes from the Austin Spurs, according to the team’s website. Both players were sent down to the D-League on Sunday. The Pistons have recalled Henry Ellenson from their D-League affiliate, the Grand Rapids Drive, Rod Beard of The Detroit News tweets. Beard notes that the rookie will be available for Detroit’s matchup with the Knicks on Monday. The Cavaliers have assigned Larry Sanders to the Canton Charge, per Sam Amico of Amico Hoops (Twitter link). Sanders has only seen two minutes of action for Cleveland this season. The Spurs have assigned Davis Bertans and Bryn Forbes to the Austin Spurs, according to the team’s website. Bertans has appeared in three games for San Antonio’s D-League affiliate, while Forbes has seen action in 18 contests. The Mavericks have recalled Manny Harris and Jarrod Uthoff from the Texas Legends, Earl K. Sneed of Fox Sports tweets. Both players will see their respective 10-day contracts with Dallas expire at the end of the day on Tuesday. The Rockets have recalled Chinanu Onuaku, Isaiah Taylor and Troy Williams from their D-League affiliate, the Rio Grande Valley Vipers, per the team’s Twitter feed. The Grizzlies have recall Wade Baldwin and Deyonta Davis from the Iowa Energy, according to the team’s website. Baldwin has played in 33 D-League games this season, while Davis has seen action in 11 contests. The Pelicans recalled Cheick Diallo from Greensboro, the team announced through a press release. Diallo, who has averaged 22.3 points over his last three D-League games, will be available for tonight’s match-up with Denver. The Spurs have recalled Bryn Forbes from their D-League affiliate, according to the team’s website. In 18 D-League games this season, Forbes is averaging 23.8 points, 3.5 rebounds and 2.4 assists per contest. The Thunder have recalled Josh Huestis from the Oklahoma City Blue, according to the team’s website. The forward is averaging 13.6 points, 6.1 rebounds and 1.1 assists per game in the D-League this season.